I’ve lost count of the number of Hindi films I’ve seen in which a bride is left at the mandap just because her family hasn’t been able to provide a massive dowry. 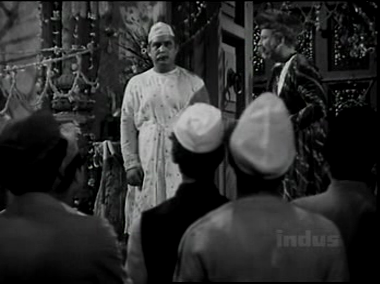 I have no idea which was the first such film to be made, but V Shantaram’s Dahej is one of the early ones. And to be expected too, from a film-maker who was deeply sensitive to the many shortcomings in the society of his time. It’s a film of the type most of us who’ve seen old Hindi films are fairly familiar with. Boy meets girl, boy falls in love with girl (and vice-versa), the topic of marriage is broached, a dowry is demanded, and various complications arise. Or being pampered by her doting father. One day, a group of college boys playing football next door send their ball sailing into the yard of Chanda’s home. One of the ‘boys’, Suraj (Karan Dewan, not looking boyish by any stretch of the most generous imagination) comes to ask for the ball. He is instantly smitten by Chanda, and even though Chanda is grumpy and abrupt with him, it’s obvious that she thinks he’s pretty attractive too. Suraj is the only son of a lawyer, Vakil Bihari Lal (Ulhas) and his wife (Lalita Pawar). Vakil Sahib has a flourishing practice, so they live in great style, in a large and fancy bungalow decorated in the height of just-independent India fashion: aquariums, wood panelling, glass screens etched with prancing deer. Unfortunately, Vakil Sahib’s success and riches have come at the cost of his own health: he suffers from very high blood pressure, and his doctor keeps advising him to take it easy. One day, a matchmaker Jamuna (?) comes to visit Vakil Sahib, and suggests a potential bride for Suraj: Chanda. (suraj = sun, chanda = moon. How perfectly matched they will be, says Vakil Sahib, gushing over the proposal). Vakil Sahib knows of Thakur Sahib. Who doesn’t, he says. Such a well-respected family, so old and honourable. And since Thakur Sahib’s family is so highly respected, it is to be expected that they are also very wealthy. They will give a grand dowry, won’t they? Jamuna, dreading the collapse of these negotiations, hurriedly assures Vakil Sahib that yes, Thakur Sahib will give a very fat dowry indeed. So Vakil Sahib gives her the go-ahead to talk to Thakur Sahib. Meanwhile, Suraj’s mother has also been intending to get Suraj married. She’s also chosen a bride for him: Leela (? ), the daughter of a very dear friend of hers. So, when her husband gives Suraj’s mother the news that he’s selected Chanda for Suraj, she is very annoyed. Vakil Sahib succeeds in mollifying her a bit (a very little bit) by telling her that Thakur Sahib will give a dowry so huge that Vakil Sahib’s house will be too small to accommodate it. But the fact that her beloved Leela will not be her bahu rankles. Terribly. 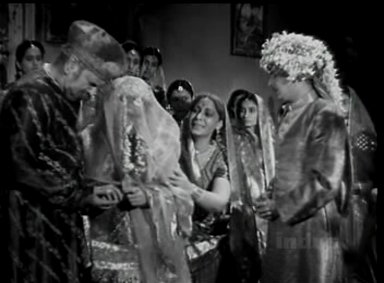 Soon, Jamuna brings Thakur Sahib along with her to Vakil Sahib’s house, to finalise the marriage. Thakur Sahib says, in his dignified way, that he won’t be able to give a large dowry for Chanda; but he will give whatever he is able to. Unfortunately, Vakil Sahib misunderstands completely. He thinks Thakur Sahib is being self-effacing. With the result that when Thakur Sahib, Suraj and his baaraat (all men) turn up at Thakur Sahib’s house for the wedding, it to discover that the dowry—meticulously inventorised and the list handed over—is pitiful. By the time Vakil Sahib finds this out, Suraj and Chanda are already married; but that doesn’t deter Vakil Sahib. He tells Suraj to leave the girl and come; the baaraat is heading back. Eventually, Thakur Sahib’s pleading has its effect, and it turns out that Vakil Sahib isn’t as intent on a fat dowry as his wife is. He makes the baaraat wait while he goes home and talks to his wife, who immediately flies into a rage and refuses to have Chanda enter the house. Vakil Sahib goes back with the message, but fortunately for Thakur Sahib, Chanda and their friends and family, Suraj steps in. An upright man, once he has clasped a woman’s hand, will never leave her while he lives, he tells his father. And so Chanda is brought home. Her mother-in-law is huffy and rude. But there’s little scope for interaction, since the newlyweds’ honeymoon—in their rooms upstairs—is spent in such blissful (and song-filled) intimacy that Chanda has very little occasion to even meet her mother-in-law. In the midst of all this, one day Vakil Sahib has been feeling especially ill. His doctor prescribes rest. 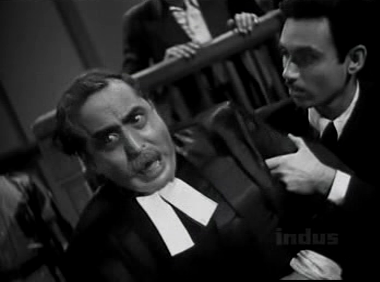 A client whose son faces a death penalty comes by, however, begging Vakil Sahib to plead his son’s case. And Vakil Sahib, bullied by the man, goes to court—and, in the middle of an impassioned appeal, suffers a stroke and falls to the ground. He is brought home, still alive but paralysed and not likely to last much longer. In fact, he lasts only long enough to scrawl a brief instruction for Suraj—that he should always obey his mother and be a good son to her—and then he’s dead, leaving behind a widow who blames her new bahu for being inauspicious enough to have killed off her father-in-law. Now where have I heard that before? Yes, Dahej does sound very clichéd, but I do wonder if it was clichéd at the time. Speaking for myself, at least, I’d say that all the trite dowry-related saas-bahu films I’ve seen were made after Dahej. 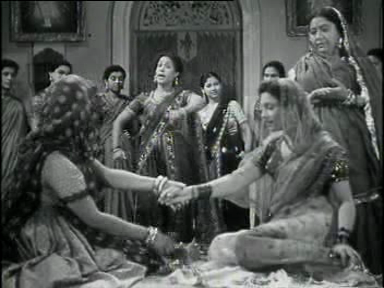 And, although it does have some of the usual plots and characters (the spineless husband, the bride who has been brought up too ‘well’ to be anything but a docile ‘cow’, the nasty and greedy mother-in-law, the other woman who wants to marry the hero, etc), V Shantaram does introduce some refreshing twists in this oft-repeated tale. There is, for example, the fact that Chanda is much loved by her parents. 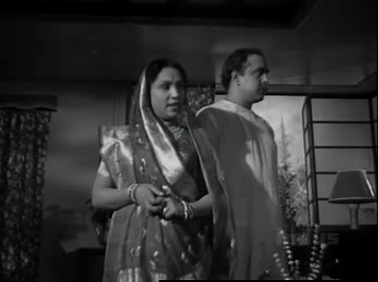 When her mother-in-law ill-treats Chanda, Thakur Sahib – who is visiting – immediately gathers up his daughter and takes her back home, vowing that he will not let Chanda return to her awful sasuraal. Which brings me to another interesting observation: the homes of the two families. 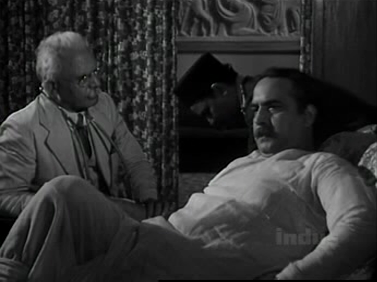 V Shantaram, without actually saying it in so many words, shows up the difference between Thakur Sahib’s household and Vakil Sahib’s household very effectively, just by showing their respective houses. Thakur Sahib’s house – an old-fashioned haveli, with beautifully carved pillars and lovely carved jaalis (screens) on the windows and balconies – is obviously an ancestral home where Thakur Sahib’s forefathers have lived and died. 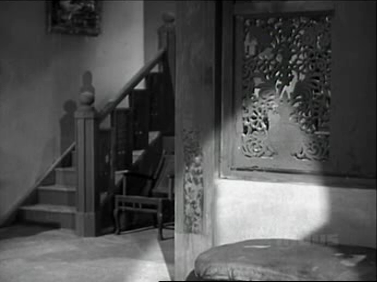 And it’s also a reflection on Thakur Sahib’s reduced circumstances: many of the jaalis on those windows and balconies are broken in places (in one telling shot, Shantaram even uses a broken jaali as a frame). This is a house that speaks of wealth and grandeur, but both past. There isn’t even enough money now to mend a fractured jaali, let alone send Chanda to her sasuraal with a fat dowry. (I love the jaali on those windows, even though they are broken). The sasuraal, on the other hand, is a very different home. Vakil Sahib’s house is big and fancy with all the trappings of new wealth but little elegance. The decorations are tawdry; the furniture is mass-produced and with nothing beautiful about it. But it’s all shiny and modern, so obviously of a newly-independent India, madly rushing into the fashionable fifties. (Thought: it may well be, of course, that it’s only I who think of this as tawdry; perhaps Shantaram just thought it was a reflection of nouveau riche). Lastly, there’s the end. Just about ten minutes before the end of the film, just as I’d given up on Dahej, it took a very odd turn that I’d not foreseen. Odd, unusual, and at the same time very effective as a means of showing just how virulent the practice of giving and demanding dowry can be. Some of the songs (the music, by the way, is by Vasant Desai). Very specifically, the ones picturised on Chanda and her friends. Although they aren’t the teasing, headstrong (even strong) gang of girls that Richard noted in Dillagi, they’re close friends, almost like sisters to Chanda. They’re the ones with whom she stages her dolls’ wedding, they’re the ones who come to dress her up for her wedding, and serenade the coming of the monsoons. Even if you don’t watch the film, do watch these songs, especially the fabulous Churi dheere pehna churiwaali, which is a gem of a picturisation. Oh, and also Ae kaale baadal bol; that too is a great song to both listen to and watch. The subtle comments on the two contrasting households – see above. I thought that a refreshingly interesting way of showing something, instead of telling it all. Jayashree. Her acting is just too theatrical for me. Karan Dewan, an indifferent actor as far as I’m concerned, has a wimpish role here which gives him little to do except smirk and sing, or wince and cringe. 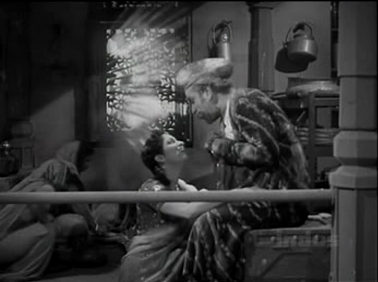 On the other hand, the supporting cast – Prithviraj Kapoor, Mumtaz Begum, Ulhas and Lalita Pawar – are in their element. Prithviraj Kapoor and Lalita Pawar especially are superb. He, dignified and genteel but up in arms (and how!) at the mere thought of his beloved daughter being in pain; and Lalita Pawar in the quintessential mother-in-law role she was to perfect. Well, already pretty much perfected in this film. Amazing! where did you find this movie. I had to laugh at your comment about Karan Dewan. And what a star cast– all well known people in those appropriate roles too,*smile* . I’ve heard about this movie. I like ‘Teen batti char rasta”- quite an amusing and tolerant movie which can be re-watched. Hello, Sumitra – and thank you for stopping by and commenting! Yes, the cast was quite formidable (and well cast, too, as you point out!) It’s been a very long time since I watched Teen Batti Chaar Raasta – I think I was a child when I saw it, so don’t remember too much except the very basics of the plot. Will try and get hold of it again! By the way, I rented this film from http://www.seventymm.com. I guess it should be available for sale on http://www.induna.com, even if you can’t find it in most stores. Ever since you told me about about Dahej, I’ve been hunting for it. But alas, it’s nowhere to be found on the Net. Okay, that Karan Dewan looks seriously weird and stupid in shorts and T. Jayshree is plain bad to look at. The story might be cliched but am in love with all these saas-bahu sagas. 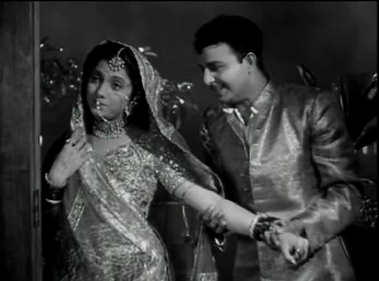 I love Lalita Pawar in almost anything and how thin Pritviraj Kapoor was!! I love him so much too! Please God please make this film appear on the Net!!! You’re welcome, Sharmi! 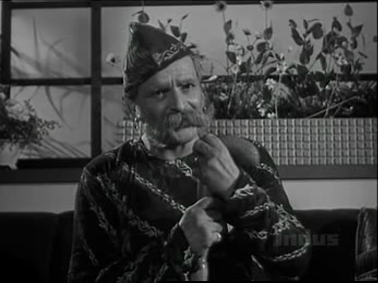 The main reason I wanted to watch Dahej was Prithviraj Kapoor, actually – that man had such presence. He is a treat to watch. And Lalita Pawar excels (as usual!) as the saas. P.S. 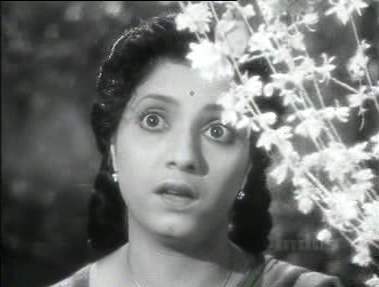 I don’t think Jayashree’s bad to look at – she just makes some very weird faces. Those wide, staring eyes, that tilted head and those pursed lips make me want to hit her! Dustedoff, thanks for the reference about the girl gangs. Yes, I liked the friendship circle in this film too, and I loved the song/scene with the swings! 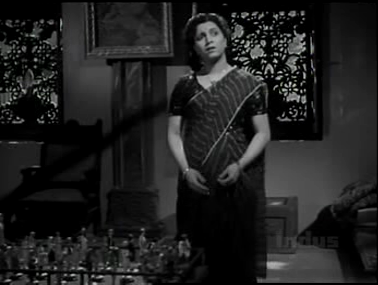 The other outstanding thing about the film was Lalita Pawar, of course. This is the film that convinced me that she was a great actress (though it’s also fun to see other films in which she plays a little bit out of the type). You are so lucky to have found this one in a DVD-and-knick-knack store, Richard! The music or DVD stores in Delhi rarely stock obscure old DVDs or VCDs – there are old films, but they’re the ones everybody knows about: the Guru Dutts, the Raj Kapoors, stuff like that. I guess some of the more obscure films will be available in Palika Bazaar, but the very thought of venturing in there makes me feel claustrophobic. I have very mixed feelings about Sandhya. She was a fantastic dancer, of course, but other than that one photo of hers that you’d put on your blog, I haven’t seen her looking especially striking elsewhere! I just read somewhere Jayshree and Sandhya were sisters! ?? That is news to me. I really don’t think so. I saw this movie aeons ago on DD and only remember the last scene. Very effective! Dowry is still given and taken. I just heard about a distant relative’s marriage, where the bride was given a flat, tons of jewellery and what not! And dowry has been prohibited since mid-80s or so? The hero’s mother is ‘Two States’ by Chetan Bhagat also cries the loss of dowry resulting from his love marriage. Are dowry deaths still being reported in newspapers? 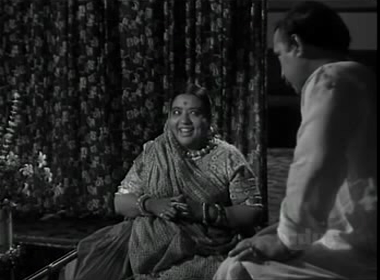 Poor Lalita Pawar the quintessential bad mother-in-law. If I hear the word saas, lalita Pawar’s image rises in my mind. I think her last big role was in ‘Sau din saas ke…’, of which I have seen a marathi and a gujarati version on DD. BTW did Mumtaz Begum play any other role than that of a mother? She looks quite young here. Loved your comparisons of thakur’s haveli and vakilsaheb’s mansion. How true about the broken jaalis of the haveli. I am sure it was intended. Do you think the furniture in vakilsahab’s mansion is mass-produced. I remember that in the 50s even the palangs of a a people in chawls were made by the carpenter personally and and good handicraft at that. A pity that many people threw such good furniture away to make way for plywood and ‘sunmike’ (?) finish. But going through your screencaps, vakilsahab’s furniture does look drab! Though the glass partition with the deer looks …., okay, also quite cheap! BTW can anybody tell me why Shantaram made his heroines go around eyes wide open? no pun intended! really! what about the postman at the postbox? neend na mujhko aaye…? hmm? …. Somehow Lalita Pawar is the quintessential mother-in-law for me too (I hope my husband’s mum isn’t reading this!! ;-)) – I’m sure she acted that role in so many films, she could probably do it in her sleep by the time the 70s rolled around. I’ve seen Sau din saas ke too. 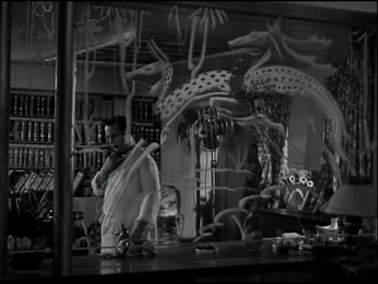 There’s this yucky scene with some boiling kheer and a lizard… ewwww. Oh, and as far as the furniture is concerned, yes: I’m sure you’re quite right and that it wasn’t actually mass produced. What I meant to say was that it had the look of something that was mass produced, those harsh lines, that lack of aesthetic sense. You know, if you compare those beautifully carved or inlaid rosewood tables one saw in old havelis with the plywood and sun-mica (that’s how it’s spelt), the latter is woefully unbeautiful. At least I think so! I’ve been wondering about the wide-eyed heroines too! 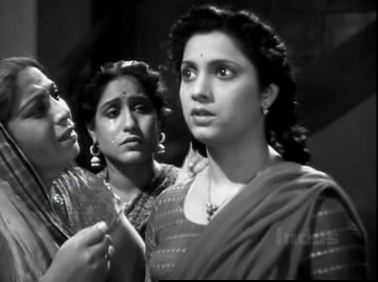 It puzzles me that a fine filmmaker like V Shantaram should have allowed his heroines to be such duds as actresses. Especially when he managed to get such superb performances from the other members of the cast. Or because he was in love with (and later married to) both Jayashree and Sandhya? Did that prejudice him and make him blind to their lack of acting ability? I checked out the song, churi dheere pehna churiwali. Indeed, it’s picturisation is lovely. The ss of Jayshree is really a dumb one, hehehe. I’m dying to know the remarkable ending!!! 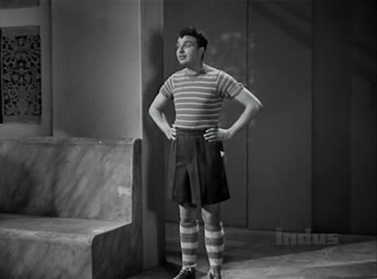 V. Shantaram always had such progressive and innovative ideas and was the one guy who, when he was trying to show a strong female character, did not have her bow to the dictates of patriarchy. Sadly, the acting department of his films left a lot to be desired! So, except for the films I watched on DD in my (very uncritical) childhood, I’ve never been able to watch anything “new”. As I’m never likely to watch this one, would you mind telling me how it ends? I am very curious about what the twist at the end is. True, V Shantaram’s films – the Teen Batti Chaar Raasta, Do Aankhen Baarah Haath and Dahej category have very strong social messages. But I’m not really tempted to watch them again and again, because the leading actors – in particular the women – invariably are a pain. I don’t blame you for not wanting to watch Dahej (if I’d known it starred Jayashree, I’d probably not have rented it either). The saas begins blaming Chanda for Vakil Sahib’s death, and tries to throw Chanda out. Her father comes visiting, and when he discovers how his daughter is being pushed around, he flies into a rage and takes Chanda back home. Suraj is too scared of his mother to follow Chanda and bring her back (odd, since he initially rebelled against everyone and brought Chanda home from the mandap). Anyway, Suraj’s mother now starts planning to get Suraj married to Leela. Suraj writes to Chanda, so she, in heartbroken mode, decides that she will herself pick flowers and weave the sehra for him. 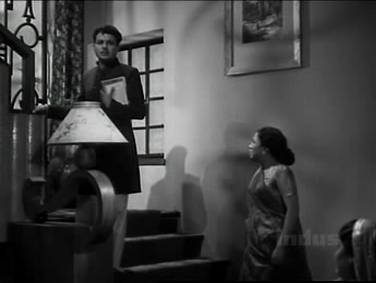 On the day of the engagement, though, Suraj is so reluctant that he tries to flee when his mother calls him downstairs – he falls off the balcony and is badly injured. Chanda forces her way into the house so that she can look after her husband. Her mother-in-law again manages to physically push her out, and Chanda spends some time with her parents before a friend eggs her on to stand up for herself. Chanda again goes back to Suraj. Meanwhile, her father realises that this has all happened because he gave an inadequate dowry, so he sells off all he has, including his haveli, and collects a huge dowry for Chanda. A large procession of men carrying all the items – furniture, vessels, etc – follow Thakur Sahib to Suraj’s house, just as Suraj’s mother decides to throw Chanda out once and for all. Chanda has locked herself into a room and refuses to leave, so Suraj’s mother gets her menservants to break down the door. It falls on Chanda, crushing her. And Suraj, upset by all the noise, tries to get out of bed and falls and dies. Chanda’s father arrives with all that dowry just in time to have his daughter die in her arms. Unusual, isn’t it? I hadn’t expected that. But it was certainly very effective. 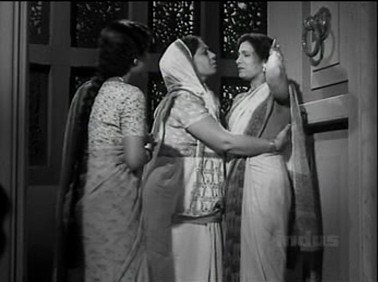 There’s this mad frame at the end too, with Lalita Pawar tearing her hair out and screeching – that was haunting. Yes. This may be an ought-to-watch if you’re a die-hard Shantaram fan (or a fan of Jayashree or any of the others), but it’s otherwise pretty ho-hum. Not worth the discomfort of having to watch it on a computer, at any rate. Thank you for covering this film. It’s been on my “must see, someday” list for a long time. Years ago I had an excellent book “Illustrated History of Indian Cinema” or something like that, which I unfortunately lost. anyway, it had a picture from “Dahej” and the author had commented that the film was considered progressive enough at the time to do some good toward the treatment of women. I think Jayashree is an interesting actress in what I’ve seen of her, the English version of Dr. Kotnis” and another Shantaram film “Subah Ka Tara” about the plight of young widows. Illustrated History of Indian Cinema (or whatever it was called) sounds interesting. I love delving into books like that, simply because so many of those little-known early films (the really early ones! 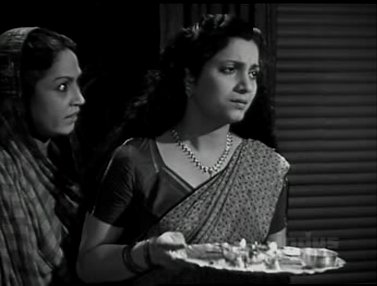 – when Lalita Pawar used to be bombshell, not mother-in-law) are otherwise so completely forgotten. To discover reproduced stills, to find some vague fact about an early film, some bit of trivia, even when a VCD or DVD isn’t available… it’s better than nothing. Subah ka Tara sounds interesting. I’d heard of it, but didn’t know what it was about. Will look out for it! Thank you for that tip. Ah. Subah ka Tara sounds as if it had potential – but V Shantaram was too much of a realist to give it a happy end. Unlike most Hindi film makers, who would’ve been only too happy to have the child bride/widow end up happily married to the man who loved her, forget about the disapproval of society. That may have been more appealing to the average Indian film-goer looking for escapism… but I guess Shantaram was less concerned with escapism than with trying to highlight a social issue. Who is this Jayshree? She doesn’t look like the dancer Jayshree T. Is she the one who plays in some mythological films (like Tulsi Vivah which has some really nice songs; and as Kaushalya in the Ramanand Sagar teleserial of Ramayana)? Just curious. No, no – no relation (as far as I know) to Jaishree T – who was probably not even born when Dahej was made. I haven’t watched Tulsi Vivah, but I seem to recollect reading somewhere that it starred Jayshree Gadkar, who is somebody altogether different – neither Jaishree T nor this Jayashree. The Jayashree of Dahej was V Shantaram’s second wife; another film which I’ve reviewed that starred her was Dr Kotnis ki Amar Kahaani. Another claim to fame was that she was the mother of 60s Hindi film actress Rajshree, who starred opposite Shammi Kapoor in Brahmachari and Jaanwar. Thanks for the clarifications DO. Wasn’t Sandhya also V Shantaram’s wife? How many wives did he have, my God! 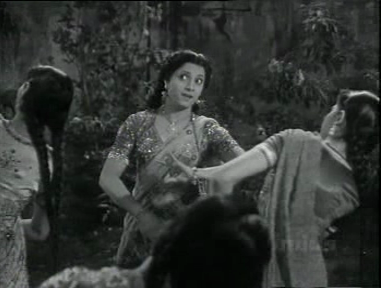 Yes, Rajshree’s forte was certainly dancing. I do recall her as being a bit too shrill for my liking, but nothing to beat Saira Banu at her peak! 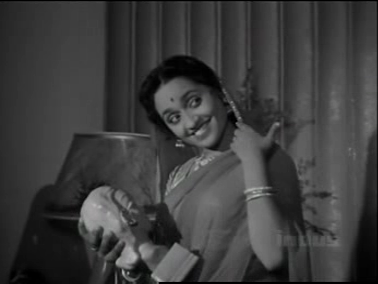 ;-) I find Rajshree very cute-looking in some of her films. Yes, I know you enjoy saas-bahu flicks! And knowing how much you like Shantaram, I think you’ll like this one too. 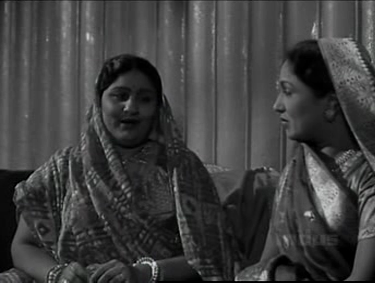 By the way, while we’re on the saas-bahu topic, have you seen Ardhangini (Meena Kumari and Raj Kumar – and Lalita Pawar, I think)? Classic film of that genre. You’re welcome. Ardh means ‘half’ (that’s why the Om Puri movie, Ardh Satya or Half-Truth). Ang means limb. So Ardhangini literally means ‘she who is half the limb’ – or rather, half the body [of her husband]. Kind of Eve-Adam like, but it used to be a common term for a wife back in the 50s and 60s.